Here's another one of those annoying ads that pop up on Facebook. This one is for the conservative activist organization, American Majority. Notice the angry Uncle Sam and the "take back America" slogan. Why is Uncle Sam so pissed off and rolling up his sleeves? 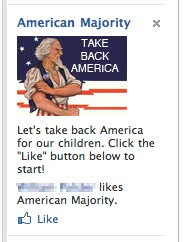 Take America back from what? Has there been an invasion? Should I look outside for mysterious looking pods? Has the spirit of Joe McCarthy infiltrated the Web? Why, in doing a Google search with on "American Majority" does the vast Internet Majority of hits bring up websites with hateful and hyperbolic rhetoric? Like father, like son. Think about it, won't you?